Database administrators are clearly aware that backup and recovery are two important elements to ensure important databases are well taken care of to avoid any data loss, affected revenue or triggering of customers’ complaints when a database crashes. Hence, a good backup and recovery tool is always a good companion to ensure the database is properly protected from any disaster. Paragon software has lately released its latest Paragon Backup & Recovery 10.1 Free Edition for non-commercial users to safeguard against the possibility of data loss. Cyclic Backup – complete infrastructure for establishing a self-acting data protection system, fully compliant with the set-and-forget backup policy. Whenever Windows fails, you can get it back on track in minutes. 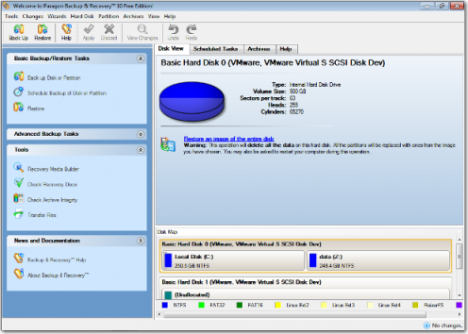 Support for the latest Windows 7 (both 32- and 64-bit), support for all existing backup techniques and of all the latest hardware as well as hard disk partitioning schemes. Backup and restore not only single GPT volumes but entire disks, including the option of resize during the restore operation. Live imaging for a Win2K+ system with two snapshot technologies onboard, i.e. MS Volume Shadow Copy Service and Paragon Hot Processing. Zero-install accomplishment of any operation with multi-platform bootable recovery media which you can build on a CD/DVD/Blu-ray disc or a thumb drive. Fast restore on a granular level without the need to restore the whole image. Advanced system of filters to automate the process of building up contents of the future backup image by excluding irrelevant data such as movies, music, etc. Users can download the latest Paragon Backup & Recovery 10.1 Free Edition via the link here. Paragon does offer another pay version with more features and functions added via its Backup and Recovery 10 Suite (a pay version) for professional users.